King Street Wharf is an area you don't necessarily equate with fine dining, so the addition of Eleven Kitchen and Cellar to the throng is a welcome one. Downstairs you'll find the cellar – a little wine bar/dining room with outdoor seating that spills out onto the wharf, and a bar packed with interesting liquor. Upstairs is the restaurant proper, which is a little more plush. Chef Jeff Schroeter (ex-Bayswater Brasserie) is rattling the pans at EKC. He cooks well, creating mod-Mediterranean dishes designed to share. But the menu structure bugs us. You've got the choice of three ($39), four ($52) or five ($65) courses to share with a minimum of two people ordering. It's not clear how much food you get (although we're assured the plates are tailored to feed everyone at the table) nor how many courses it's appropriate to order. Why make it more complicated than it has to be? Start with the duck and pork rillettes served with crisp mini toasts and old-skool pickles and move onto the light, briny sardines – they're fried until crisp-skinned and served on a bed of eggplant that's slow cooked and served all soft and squishy. The crisp-skinned spatchcock is definitely worth ordering – it's served sliced with a super-refreshing salad of jicama (a Mexican root vegetable), coriander, baby cress, celery leaf and preserved lemon. Schroeter also does a mean twice-baked souffle that you should order if it's on. 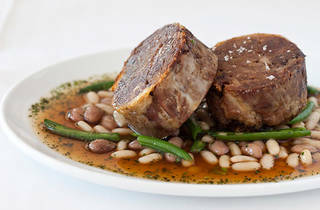 Finish with something with a bit of grunt such as the slow-roasted lamb shoulder. 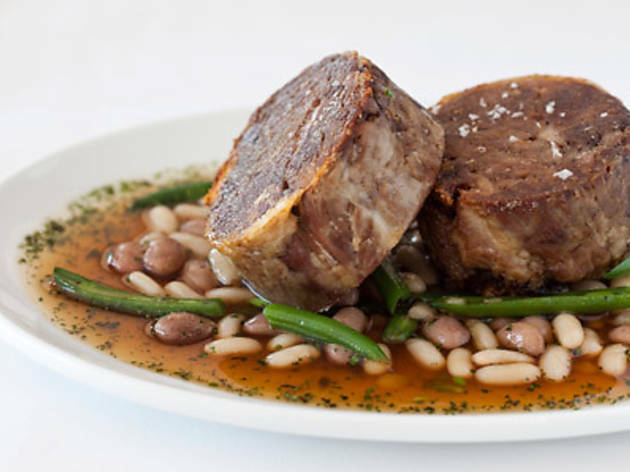 The meat is rolled and it rests on a salad of many beans – borlotti, cannellini and French. David Murphy (previously at Ash St Cellar) is running the floor at Eleven. The staff have solid wine and cocktail knowledge; they mix a great Hemingway Daiquiri, even if they can't spell it on the menu, and make it a comfortable place to dine. Since Time Out was eating with our wine writer Mike Bennie, we let him comment on the drinks. "It's an inspired shortlist that captures the current vogue of wine drinkers while complimenting the scope of the kitchen," says Bennie. "As a wine wanker, I wouldn't necessarily go back to explore the list, but would always enjoy having a dig." It's a solid operation: great menu, friendly staff who may be a little forgetful at times (they completely forgot our dessert, but at least it wasn't on the bill), a wine list you'll want to drink, plus some great views of Darling Harbour. We'd definitely go back. Lunch Tue-Fri 12 noon-3pm; Dinner Tue-Fri 6pm-10pm; Sat 6pm-10pm.